Facebook is getting into the year-end spirit by releasing its list of the top words found in U.S. Facebook status updates during 2009. 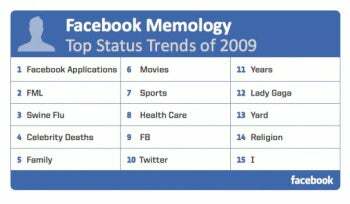 The social network calls its list "Memology: the study of how 'memes,' or new ideas and trends, are spreading on Facebook." To determine the list, Facebook grabbed the most popular one-to-four word phrases found in status updates this year, and then compared each phrase to 2008 trends to determine the most popular phrases of 2009. The past year was the year of farms and aquariums on Facebook, but one thing the social network neglected to mention were the series of reports by TechCrunch alleging that popular applications like Farmville and others were scamming users. References to Michael Jackson and other celebrity deaths also proved popular fodder for Facebook chatters, as did the more popular movies of the year. The term "I" might seem to be an odd one to make the list, but, as Facebook's blog notes: "Until March of 2009, people updated their status in a box that appeared next to their name on the home page and, consequently, many updates started with the word 'is.' Once that box no longer was shown next to people's name, the usage of "is" dropped off dramatically and usage of "I" doubled almost overnight." While the social network made its own memology list under the moniker FB, one notable exclusion from Facebook's list is any mention of the privacy concerns that dogged the company during 2009. But in a nod to the problems it faced this year, Facebook did say in its memology blog post that all personally identifiable information was removed from status updates during the year-end data mining exercise. The company also said no one at Facebook ready actual status updates in compiling this list.